Along with a number of his allies and adversaries, Batman finds himself transplanted from modern Gotham City to feudal Japan. For an unusual take on the Dark Knight, we go to 2018’s Batman Ninja. A “time displacement machine” run by Gorilla Grodd (voiced by Takehito Koyasu for the Japanese version, Fred Tatasciore for the English) sends plenty of Batman’s (Kôichi Yamadera/Roger Craig Smith) enemies back to feudal Japan – along with the Caped Crusader himself. Making the best of the situation, Joker (Wataru Takagi/Tony Hale) and other baddies operate as feudal lords. 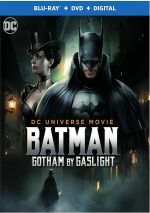 Along with some of his pals, Batman battles his foes and attempts to return to present day Gotham. Going into Ninja, I assumed it came from the usual suspects at DC Animation, but instead, it comes from an entirely Japanese cast and crew. As implied above, the original also went with Japanese dialogue, though the disc includes the English dub as well. That gives Ninja a unique flavor, as it makes liberal use of Japanese animation techniques and trends. This becomes a Japanese view of Batman rather than a Western interpretation, something that adds real spark to the proceedings. I also went into Ninja with the assumption it’d follow an “alternate universe” theme. I thought it’d bring us a tale ala Gotham By Gaslight, one in which Batman existed as a feudal Japanese character, not one in which our 21st century Dark Knight visits the past. Initially, I felt disappointed by the tired time travel concept, but Ninja works so well that I don’t care. An exciting, unhinged mix of Western characters and Eastern styles, the result thoroughly entertains. Though one might not want to think too hard about the logic involved, as Ninja makes barely a lick of sense. To avoid spoilers, I won’t get into details about what we see, but the film takes on a lot of crazy concepts that require the viewer to suspend – nay, demolish - disbelief. Which came as another surprise, as I’d figured Ninja would go for a feel ala something like Seven Samurai, just with Batman characters. This seemed like an opportunity for a more sedate, serious view of the themes and participants. Boy, was I wrong! While Ninja occasionally veers into more somber domains, those don’t last long, as the film prefers a much wilder experience. Despite my skepticism, this works, as Ninja manages to utilize the anime stylings in a lively manner. It may toss out one ludicrous situation or scenario after another, but it does so with such unhinged gusto that I can’t complain. And I won’t complain, as Ninja just delivers too much fun for me to quibble. Wacky, weird and wild, the movie brings us 86 minutes of action entertainment. Batman Ninja appears in an aspect ratio of approximately 1.78:1 on this Blu-ray Disc. The movie offered a strong visual presentation. At all times, sharpness remained terrific. Virtually no softness crept into the image, so we got a tight, well-defined package. Though some of the fine pencil lines could look a little jagged, those instances were very minor and rare. Overall, the image lacked issues in that regard, and it also suffered from no shimmering, edge haloes or source flaws. Given all its wild visuals, Ninja boasted a dynamic palette that happily deviated from the usual trend toward orange and teal. The movie’s colors went with a nice variety of hues, all of which appeared lively and bold. Blacks seemed deep and dark, while low-light shots presented nice smoothness and clarity. This ended up as a solid image. Though not quite as good, the movie’s DTS-HD MA 5.1 soundtrack added punch to the proceedings. With all sorts of chaos and mayhem on display, the mix opened up well and used the various speakers to create a lively sonic environment. That said, I thought the mix could’ve provided better integration. While we got a lot of action, the elements didn’t always mesh as well as I’d prefer. Still, the soundfield fared well as a whole, even if it could’ve used a better sense of movement and connection. Audio worked fine, with speech that came across as natural and concise. Music appeared vivid and full, as the score remained well-depicted. Effects added spark to the material and showed nice accuracy and depth, with warm, tight bass. The minor awkwardness of the soundfield took this to a “B”, but it was still a pretty good mix. Note that the Blu-ray also includes the film’s original Japanese audio. Normally I’d use that as the basis on my review, but unfortunately, Ninja failed to give the Japanese track the lossless treatment, and I default toward the highest quality version. While I’m happy to get the original mix, it should’ve been DTS-HD MA 5.1. A few extras appear, and a featurette called East/West Batman runs 17 minutes, 33 seconds. It offers comments from DC Entertainment Creative Director Mike Carlin, DC Entertainment Interactive and Entertainment VP Ames Kirshen, screenwriter Kazuki Nakashima, character designer Takashi “Bob” Okazaki, producers/English screenwriters Leo Chu and Eric S. Garcia and director Jumpei Misuzaki. “East” looks at story/characters as well as the integration of Batman into the feudal Japanese setting, visual/animation styles, audio, and animation. This becomes a generally good look at the production, albeit one without a ton of real depth. Batman: Made in Japan fills 14 minutes, three seconds with info from Chu, Carlin, Garcia, Kirshen, Okazaki, Mizusaki, Nakashima. In this show, we learn about visual choices, influences, and animation. “Japan” expands on “East” and becomes another fairly useful program. 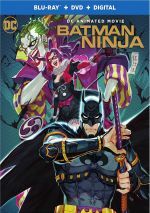 Next we get New York Comic Con Presents Batman Ninja. A 49-minute, two-second piece, this offers a panel with Nakashima, Okazaki, Mizusaki, Chu, and Garcia. The participants discuss the project’s roots and development, story/characters, animation, the English adaptation, music, cast/performances, and related topics. This tends toward the promotional side, but we still get a decent array of insights. The disc opens with an ad for Teen Titans Go! To the Movies. Trailers tosses in an ad for Justice League. A second disc provides a DVD copy of Ninja. It includes the Comic Con reel but lacks the other extras. The Dark Knight meets anime via the wild Batman Ninja. Goofy but still dramatic and exciting, the movie works much better than I expected. The Blu-ray brings us excellent visuals along with generally good audio and a few informative bonus materials. A clever twist on the characters, Ninja becomes a fun ride.